Atec is continually striving to update capabilities and capacities in our machine shops. 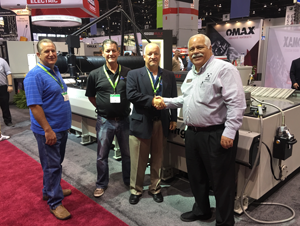 September 12-15, Atec personnel attended the International Manufacturing Technology Show in Chicago, IL at McCormick Center and purchased 5 new machines: Haas VF-4 Mill with 5-Axis Drive, Haas UMC-750 simultaneous 5-Axis Mill, Omax 60120 9-Axis WaterJet, Global Advantage 9.12.8 CMM, and Micro-Hite 900 with digital controller. “The Atec machine shop is very busy—we are accepting new programs, and we are expanding. 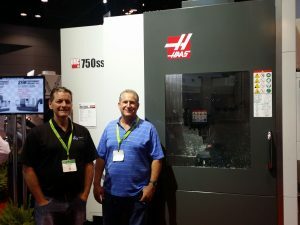 It is an exciting time, and with the addition of Hager Machine & Tool to our family we have increased our manufacturing output,” said Atec President, Paul Fenley. Atec has a 3D Printing Initiative and is working to be on the forefront of 3D Printing. Justin Maham, ME at Celtech attended the conference, along with Paul Fenley, Mike Patterson, and Mark Cummings. Atec’s 3D printing initiative has been underway for 3+ years. 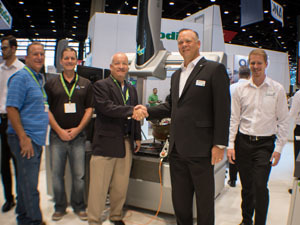 Following research and attendance at earlier IMTS, JANNAF and other forums, Atec purchased a small Zortrax M200 to gain hands-on organic experience with additive manufacturing, including interface to our powerful 3D modeling software. Atec identified independent 3D printing sources in the Houston area and gained from these exchanges. Our Space Products group works closely with Aerojet Rocketdyne, which is seen as one of the premier users of metal 3D printing in the U.S. We also work regularly with Pratt & Whitney, GE, Honeywell, Boeing, Space X, Orbital ATK, Rolls, USAF and others who are machining precision aerospace components using additive methods. Recently, Atec was invited to pursue definitive grant proposals through Oklahoma, New Mexico, Texas and federal sources to complete our study efforts and move to first stage of a brick & mortar Additive Manufacturing Center. Atec is following up on these invitations and we expect to see kickoff in 2017 and full operations in 2018. Stay tuned!